Richard T. Turner Lodge #116 F.& A.M. Welcome to our Lodge. Here you can get basic info and contact us if you need to. We eat before every meeting at 6:30PM. All are welcome for dinner. You can call or email us or come and visit the Lodge before a meeting. You can fill out a petition for membership which will require you to have 2 Master Masons in good standing to vouch for you. At least one must be from the lodge you are petitioning to and you should know these men well. Currently, Dues are $69.00 per year and you can pay them by check, cash or use the PayPal link below. Meetings are every 2nd and 4th Friday of each month. June, July, August, Nov., and Dec. are 2nd Friday only. We eat at 6:30PM every meeting and Meet at 7:30PM. Most meetings are about 1-2 hours long and are ususually enjoyed by all. What if I am behind on dues or haven't attended for a long time? If you have only missed one or two years you can easily pay your dues with check, cash, or Paypal. You can mail it to the PO Box or better yet, come to a meeting. If you haven't paid dues over 2 years your membership has most likely been temporarily suspended and you will have to fill out a Reinstatement Petition and catch up the 2 or 3 years you missed to be reactivated as a member. Call the secretary for information at the number listed here. Even if you haven't attended in 20 years we would love to have you back and welcome your attendance. Freemasonry is a society of Friends and Brothers who gather to help themselves be better men, help their fellow brothers, make their community better, and assist the families and widows of current and passed Masons. 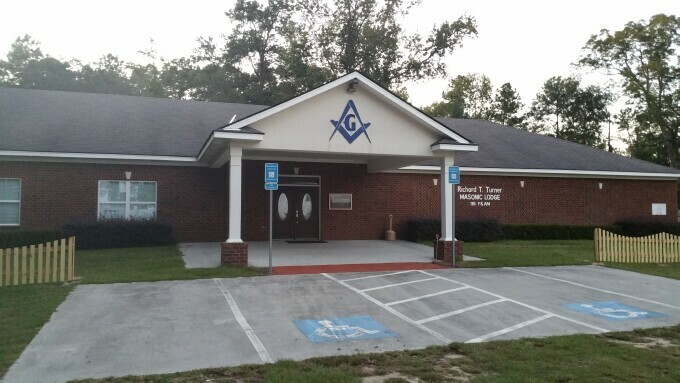 We have fundraisers to pay our Lodge bills, raise money for the Masonic Children's Home in Macon, GA, and give to those in need in the local area. How do I contact a Mason for questions? Just call or contact via the links at the bottom of the page. Email Us and we will put you on the announcement list.